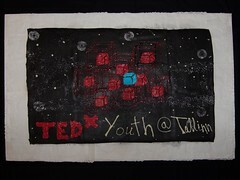 ORGANIZE TEDxYouth@Tallinn 2016 SIMULCAST IN YOUR COMMUNITY! TEDxYouth@Tallinn 2016 organizers would like to share all good ideas with many more people than we can fit into our venue. That means there will be a live webcast and we ask you to organize viewing parties (simulcasts) in Estonia and abroad! You’ll be able to watch the webcast in English or in Estonian (with synchronous translation). What is TEDxYouth@Tallinn 2016 simulcast? Simulcast offers a chance to watch TEDxYouth@Tallinn 2016 live webcast with your friends, colleages, schoolmates or organization members. you may not promote any products, services, companies or organizations during the simulcast event nor use the attendee data for any other purpose than for communication on simulcast matters. as a simulcast organizer you’ll have to record attendees names and e-mail addresses, so we’ll be able to send feedback forms to them to be better the next time!